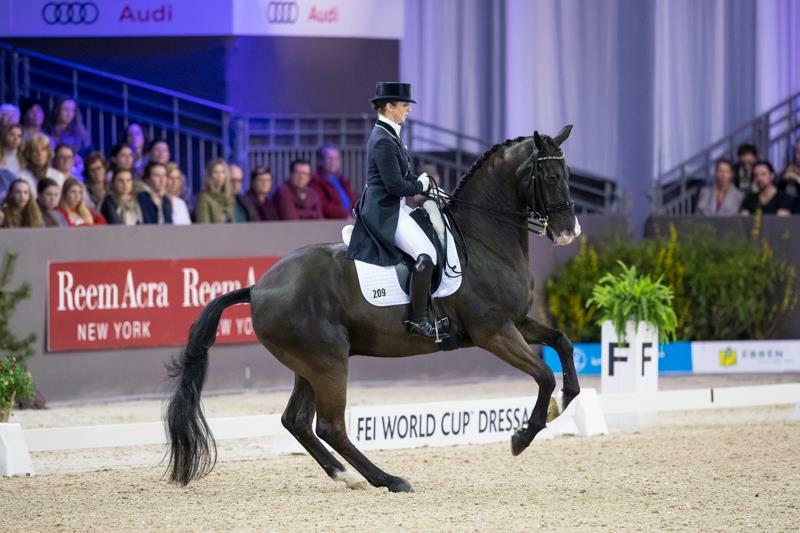 Judy Reynolds and Vancouver K set a new Irish international record score of 80.29% when placing seventh in the Grand Prix Kür (Freestyle to Music) at the eighth leg of the FEI Dressage World Cup™ 2018/2019 Western European League in Amsterdam, The Netherlands today [Saturday, January 26, 2019]. She broke her own record Irish international Grand Prix Kür (Freestyle to Music) score of 79.70% set at the five-star show in Al Shaqab Doha, Qatar in March 2016. "I'm really delighted to break 80% and set a new Irish international record score" said Judy "It has been coming for a while and great to achieve it here in Amsterdam in a very hot class. It is the year of the European championships and I hope that there is more to come this season." Judy placed fifth in the FEI World Cup Grand Prix yesterday [Friday, January 25, 2019] on a score of 74.717%. The reigning FEI World Cup champion, Germany’s Isabell Werth and Weihegold OLD won the qualifier on a score 86.810%.